UNITED NATIONS, July 19 -- In the run up to climate change day in the Security Council, the Germany presidency of the Council summoned Permanent Representatives Tuesday morning for a last try to agree on a Presidential Statement which would call for periodic reports on climate and security. Several small island states are supporting Germany, the UK, France and others in this. Nauru's president Marcus Stephen, for example, had an op-ed in Tuesday's New York Times calling for a new UN Special Representative on climate and security. Papua New Guinea, too, has expressed a need for Council action. On the other hand the Non Aligned Movement at the leadership level has opposed “encroachment” by the Security Council and its five Permanent members on the issue. Some questions, who is the underdog here? Nauru or Egypt, a perennial power on NAM, even after Mubarak's fall? In a sense the debate has a dumb bell structure, with some small island states joined with some large European powers. These proponents pointed the figure at not only China and Russia, but also South Africa and India as opposing the Presidential Statement or any outcome from the meeting. Moments later, Inner City Press learned that inside the closed door consultations, China said its position has not changed, it is opposed to the Presidential Statement. And that, one Permanent Representative told Inner City Press, would appear to be that. 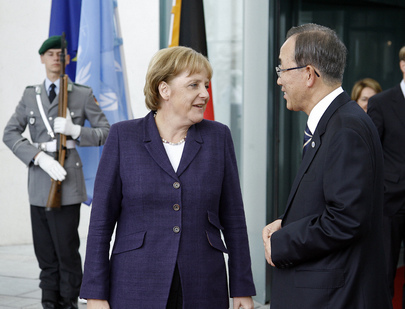 UNITED NATIONS, July 18 -- While Germany has been pushing on climate change for a Security Council Presidential Statement after the July 20 meeting, numerous Council members expressed doubt to Inner City Press on Monday night. “It's as if they think only the Security Council can deal with anything,” one Council member complained. The Non-Aligned Movement has been lobbying against Security Council jurisdiction over climate change. Meanwhile some small island states, many in the Pacific, see the seas rising and want the Council and its powers under Chapter Seven of the UN charter to be invoked. That is the tension, within the Association of Small Island States or AOSIS: which ones need the Council's involvement, on issues like their fishing rights even if their land is overrun, and those aligned with NAM. "The Brits in 2007 said it wouldn't be a precedent," one member told Inner City Press of a UK sponsored Council meeting in that year. "Now they're citing it. So we say no." Germany still believes a Presidential Statement is possible, saying it has been calling Moscow and Beijing. But such a Statement require unanimity, and other capitals must be called. And there it is harder for the administration of Angela Merkel to exert pressure. Here is the German mission's concept paper, click here. The initial proposal was for a brand new Special Representative of the Secretary General, to report to the Council every six months. Even an AOSIS member told Inner City Press, “too expensive.” Now the idea is Secretary General reports, and language that makes clear the Council is not encroaching on other bodies. On July 19 there is an AOSIS meeting at 9 am, then Germany has called a meeting of Permanent Representatives at 10. “If they had a PRST, they wouldn't need a Perm Rep meeting,” a Council member told Inner City Press. But hope springs eternal -- and the seas are rising. Watch this site.